There is an increasing selection of fashionable and stylish clothing that does not contain animal products. Find out more about alternatives to animal-based materials such as silk, leather, and wool. Those who are interested in a vegetarian/vegan way of life usually begin with changing their diet. But once that is done, there are various other areas of life that often involve animal products. Fashion, which is already a frequently debated topic, is one of those areas. While fur has long been frowned upon, there are other animal components in our clothing that many people may not be aware of. Clothing may not contain any animal products if it is to be considered vegan. As a consumer, it is important to take a close look and pay attention to the materials used to make a piece of clothing. If you want to be considerate not only of animals but of the environment as well, you should also favour renewable plant-based alternatives over fossil-based synthetic fibres. In addition to reducing the impact on animals and the environment, buying vegan clothing that is fairly produced and traded supports workers in the textile industry. 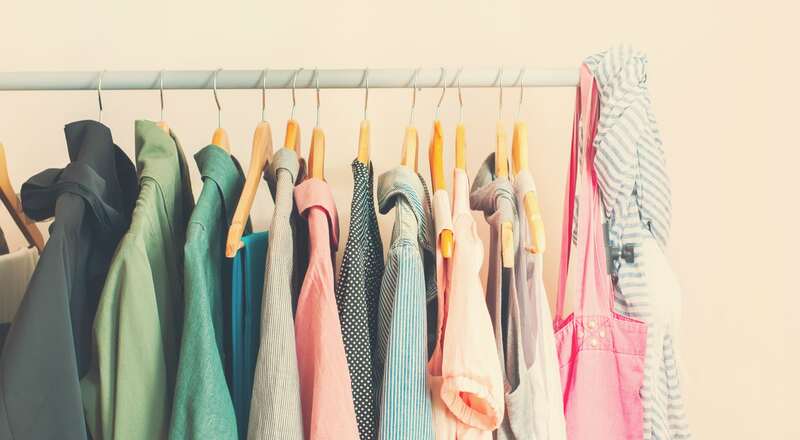 Currently, very few clothes carry a vegan label on the material itself. The only way to determine which materials have been used in an item of clothing is to check the label. If it is indicated that a garment includes non-textile components of animal origin, then the garment is definitely not vegan. If there is no clear indication, however, the best option is to contact the retailer or manufacturer directly. Upper material, lining, and outsole are classified as leather, coated leather, textile (including wool, silk, fur), or other (e.g. rubber, plastic). The material specified on the label is the one that covers at least 80% of the surface area and accounts for 80% of the shoe’s volume. The remaining materials are not represented by symbols, which means that one cannot rule out animal-based components at first glance. Adhesives, in particular, are often made from animal products – many shoes of animal-free brands are therefore sewn instead of glued. Imitation leather is not the only option for vegan shoes, however: other alternatives include cotton blends, mushroom and pineapple leather, wood, vegan felt, cork, and an algae-based foam. Leather is animal hide which is preserved by tanning. However, leather is not simply a by-product of the meat industry – much of the slaughter worldwide is carried out exclusively on behalf of the leather industry. Additionally, contemporary leather production is a poisonous business since industrially mass-produced leather is mostly tanned and treated with toxic chemicals.2International Finance Corporation & World Bank Group (2007): Environmental, Health and Safety Guidelines for Tanning and Leather Finishing. Online Unter http://www.ifc.org/wps/wcm/connect/de6c3d00488556f2bb14fb6a6515bb18/Final%2B-%2BTanning%2Band%2BLeather%2BFinishing.pdf?MOD=AJPERES&id=1323152378134 [19.07.2017] It’s also easy to overlook leather patches, which are often found on trousers and jackets. Cashmere wool (also known simply as cashmere) comes from the undercoat of the cashmere goat and is partly torn out of its fur with wire brushes without regard for the animal. Cashmere wool is very expensive and its wearers demand high standards. After shearing, the goats have a significantly higher mortality rate, especially during cold weather, due to the absence of their insulating coat.10McGregor, B. (2001): Avoiding weather induced deaths of goats. Goat notes B19: Avoiding weather induced deaths of goats, pp. 76-77. Mohair is the hair of the Angora goat. Most mohair comes from South Africa and the USA. Due to its light, velvety texture and its special shine, it is highly sought-after and much more expensive than sheep’s wool. Shortly before shearing, the goats are dipped in water to remove dust and dirt from the fur. In older goats, the procedure is repeated approximately every six months. Young goats experience the stress of the shearing process more often as their fur is particularly soft. Horn is a substance that consists of keratin-rich dead cells. Horns, hooves, and bird beaks all consist of horn. This material is mainly used for the production of buttons, jewellery or combs. Nacre is extracted from the shells of mussels. It is not uncommon for the animals to be killed for this purpose, or even to die while they are being bred. It is used, for example, in jewellery, and decorative buttons. Textile dyes may contain carmine produced from lice, indigotine made from snails, bone charcoal, and binding agents of animal origin. In addition, many adhesives for shoes and handbags contain animal ingredients. Animal glue usually consists of bones and/or skin, while the milk protein casein is also used to produce adhesives. Today, however, many manufacturers resort to inorganic adhesives because they are less soluble in water. In general, there is no obligation to label these substances and the only way to determine if an item contains any traces of animal products is to make contact with the manufacturer and ask them directly. Cotton is considered the world’s most important raw material for textiles. The seed hairs of the capsule fruit are picked from the cotton plant and then spun into a yarn from which garments are made. For the sake of the environment, it is better to use organic cotton, which is grown without agricultural toxins (artificial fertilisers and pesticides). Cork is particularly easy to care for. It is also breathable, splash-proof, and has a characteristic quirky look. Jackets, belts, wallets, bags, and shoes can be made of cork. Hemp grows without the use of pesticides or chemical fertilisers because the plant can protect itself. Hemp clothing is very dirt-repellent and more durable, more absorbent, and warmer than cotton. Hemp is completely biodegradable and is especially suitable for people with allergies. Linen is made from flax fibres, which require few pesticides or fertilisers for cultivation. It is one of the oldest cultivated textile fibres. Once it is woven into fabric, linen feels cool and fresh and is very tear-resistant. In addition, linen fabrics are lint-free and do not absorb odours as quickly as other fabrics. Linen is completely biodegradable and recyclable. Lyocell is also a cellulose-based fibre, usually with wood pulp as the basis. However, the chemical process used for its production differs from, for example, the one used for viscose, and it is, above all, a more environmentally friendly fibre. Lyocell is often marketed under the brand name Tencel. It is biodegradable and recyclable. Soy protein fibres are a by-product of the manufacturing process of soy products. As finished garments, they are similar in appearance to silk and as warm and comfortable as cashmere. Soy silk is biodegradable and relatively durable. Viscose is produced by means of a chemical process based on natural cellulose, usually from bamboo, eucalyptus or beech wood. The properties of viscose include a pleasantly soft feel to the skin, similar to what you would expect from a mixture of cotton and silk, as well as complete biodegradability. Acrylic fibres consist mainly of polyacrylonitrile (PAN) and have wool-like characteristics. They are warm, soft to the touch, and are crease-resistant. However, they should only be washed at a maximum temperature of 40 °C, as they are very sensitive to heat. Clothes often consist of a mixture of cotton and acrylic. Imitation leather consists of a mixture of different textile fabrics. In the past, these were usually coated with PVC, but nowadays the coating tends to be polyurethane. Imitation leather is cheaper than genuine leather and manufacturers can always guarantee consistent quality. Furthermore, there is hardly any difference compared to conventional leather. Polyethylene terephthalate (PET) is frequently used to make clothes. The fibres are very tear-resistant but poor at absorbing liquids, which is especially useful for sportswear. PET is often also blended with other materials. There is a downside to using synthetic fibres such as acrylic and polyester, since washing these fabrics releases microfibres into the wastewater and therefore into open waters. This poses a threat to many animal species and our environment. It is, therefore, best to choose the above-mentioned biodegradable alternatives or other plant-based materials. The Munich-based label Nat-2 has developed the world’s first sneaker whose outer material is based on fair and sustainable wood. Additionally, an English company called VIVOBAREFOOT is bringing shoes to market that are made from an algae-based plastic. Last but not least, materials consisting of pineapple or eucalyptus leaves are also receiving attention as vegan leather alternatives. These can be used for a variety of products, such as shoes and bags. With vegan fashion on the rise, conscious consumers can look forward to a substantially wider selection of animal-free clothing in the future. 3, 5. ↑ SCAHAW (2001): The Welfare of Animals Kept for Fur Production. Report of the Scientific Committee on Animal Health and Animal Welfare adopted on 12-13 December 2001. Online under http://www.furfreealliance.com/wp-content/uploads/2016/08/welfare_animals_kept_for_fur_production.pdf [11.07.2017]. 10. ↑ McGregor, B. (2001): Avoiding weather induced deaths of goats. Goat notes B19: Avoiding weather induced deaths of goats, pp. 76-77.